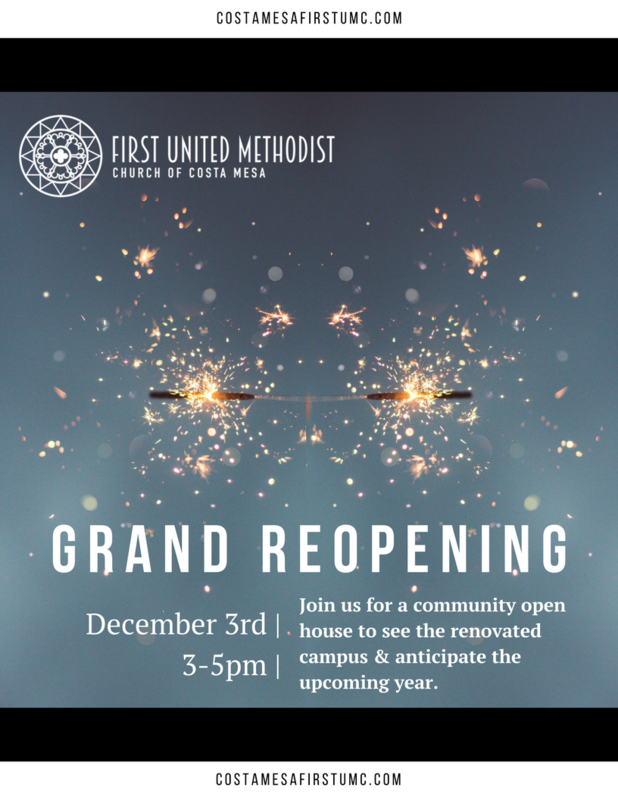 ...before our Grand Reopening and remember what it signifies for us as a growing community here at Costa Mesa First. Huge parts of our campus' redevelopment came together this week (who knew how exciting parking and paint could be)! In addition to those pieces, we get to acknowledge years of small movements toward creating a space to be—a space where we can grow into traditions, make new friends, share joys, pray over concerns, and gather weekly around this sacred story we call gospel. This Sunday's Grand Reopening is about a group of people who've remained dedicated to the Costa Mesa community and maintained a beautiful home that welcomes AA meetings, weddings, potlucks, and artistic gatherings. Together, we get to take part in that story. Invite people to come. Businesses, family, past members or potential members—whoever you think would love to see the renovated space or would be interested in utilizing it for future events. If you're coming and use Facebook, go to our event page and register yourself as "Going" to the event. Click here to RSVP on Facebook. Come to our 9:30 am workday this Saturday. We'll be preparing the church by mopping floors, cleaning furniture, hanging photos, and putting together our coffee bar. Thank you for taking part in all this. We're looking forward to the weekend with you!